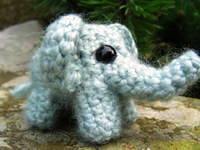 A cute little elephant pattern from Brie at Roman Sock, to perch on your shoulder or shelf. Smaller pieces can be fiddly to create, but the cuteness more than makes up for it! Hi Jane, how small are these little fellas! I don't know much about Amigurumi, but it does look like they are crocheted. Am I right? You're right Gina, they are crochet. If you're using 8ply yarn with a 3mm hook, they should end up about 2 inches high. - although that's just a guess as I haven't made one myself.